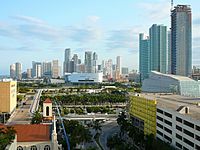 Miami-Dade County (formerly Dade County) is an American county located in the southeastern part of the U.S. state of Florida. It is the southeasternmost county on the U.S. mainland. According to a 2015 census report, the county had a population of 2,693,117, making it the most populous county in Florida and the seventh-most populous county in the United States. It is also Florida's third-largest county in terms of land area, with 1,946 square miles (5,040 km2). The county seat is Miami. Miami-Dade County is included in the Miami-Fort Lauderdale-West Palm Beach, FL Metropolitan Statistical Area. The county is home to 34 incorporated cities and many unincorporated areas. 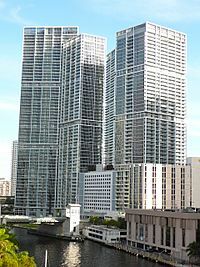 The northern, central and eastern portions of the county are heavily urbanized with many high rises up the coastline, as well as the location of South Florida's central business district, Downtown Miami. Southern Miami-Dade County includes the Redland and Homestead areas, which make up the agricultural economy of Miami. Agricultural Redland makes up roughly one third of Miami-Dade County's inhabited land area, and is sparsely populated, a stark contrast to the densely populated, urban northern Miami-Dade County. The western portion of the county extends into the Everglades National Park and is populated only by a Miccosukee tribal village. East of the mainland in Biscayne Bay is also Biscayne National Park and the Biscayne Bay Aquatic Preserves. Juan Ponce de León was the first European to visit the area in 1513 by sailing into Biscayne Bay. His journal records that he reached Chequescha, a varianth of Tequesta, which was Miami's first recorded name. It is unknown whether he came ashore or made contact with the natives. Pedro Menéndez de Avilés and his men made the first recorded landing when they visited the Tequesta settlement in 1566 while looking for Avilés' missing son, shipwrecked a year earlier. Spanish soldiers led by Father Francisco Villarreal built a Jesuit mission at the mouth of the Miami River a year later but it was short-lived. After the Spaniards left, the Tequesta Indians were left to fend themselves from European-introduced diseases like smallpox. By 1711, the Tequesta sent a couple of local chiefs to Havana, Cuba, to ask if they could migrate there. The Cubans sent two ships to help them, but Spanish illnesses struck and most of the Indians died. After the Second Seminole War ended in 1842, William English, re-established a plantation started by his uncle on the Miami River. He charted the “Village of Miami” on the south bank of the Miami River and sold several plots of land. In 1844, Miami became the county seat, and six years later a census reported that there were ninety-six residents living in the area. The Third Seminole War was not as destructive as the second one. Even so, it slowed down the settlement of southeast Florida. At the end of the war, a few of the soldiers stayed. 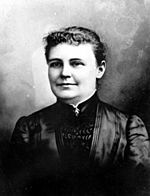 Julia Tuttle (1849-1898), the founder of Miami. Crowds on Flagler Street in Downtown Miami on August 15, 1945, 20 minutes after the announcement of Japan's surrender at the end of World War II. Dade County was created on January 18, 1836, under the Territorial Act of the United States. The county was named after Major Francis L. Dade, a soldier killed in 1835 in the Second Seminole War, at what has since been named the Dade Battlefield. At the time of its creation, Dade County included the land that now contains Palm Beach and Broward counties, together with the Florida Keys from Bahia Honda Key north and the land of present-day Miami-Dade County. The county seat was originally at Indian Key in the Florida Keys; then in 1844, the County seat was moved to Miami. The Florida Keys from Key Largo to Bahia Honda were returned to Monroe County in 1866. In 1888 the county seat was moved to Juno, near present-day Juno Beach, Florida, returning to Miami in 1899. In 1909, Palm Beach County was formed from the northern portion of what was then Dade County, and then in 1915, Palm Beach County and Dade County contributed nearly equal portions of land to create what is now Broward County. There have been no significant boundary changes to the county since 1915. The third-costliest natural disaster to occur in the United States was Hurricane Andrew, which hit Miami early Monday morning on August 24, 1992. It struck the southern part of the county from due east, south of Miami and very near Homestead, Kendall, and Cutler Ridge (now the Town of Cutler Bay). Damages numbered over US$25 billion in the county alone, and recovery has taken years in these areas where the destruction was greatest. This was the costliest natural disaster in US history until Hurricane Katrina struck the Gulf region in 2005. 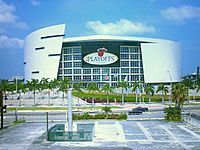 On November 13, 1997, voters changed the name of the county from Dade to Miami-Dade to acknowledge the international name recognition of Miami. Voters were acting pursuant to home rule powers granted to Dade County, including the ability to change the name of the county without the consent of the Florida Legislature. The change in name also addressed a source of public dissatisfaction with the name "Dade" which was chosen to honor of Francis L. Dade, who had been killed in the Dade Massacre in the 1830s. The Massacre did not occur in South Florida, but in the west central part of the state, in present-day Sumter County, near Bushnell. There is also a Dade City, which is closer to the site of the massacre. According to the U.S. Census Bureau, the county has a total area of 2,431 square miles (6,300 km2), of which 1,898 square miles (4,920 km2) is land and 533 square miles (1,380 km2) (21.9%) is water. It is the third-largest county in Florida by land area and second-largest by total area. Most of the water is in the Biscayne Bay, with another significant portion in the adjacent waters of the Atlantic Ocean. Miami-Dade County is only about 6 feet (1.8 m) above sea level. It is rather new geologically and located at the eastern edge of the Florida Platform, a carbonate plateau created millions of years ago. Eastern Dade is composed of Oolite limestone while western Dade is composed mostly of Bryozoa. 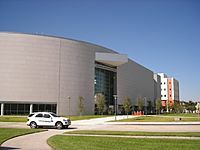 Miami-Dade is among the last areas of Florida to be created and populated with fauna and flora, mostly in the Pleistocene. The bay is divided from the Atlantic Ocean by the many barrier isles along the coast, one of which is where well-known Miami Beach is located, home to South Beach and the Art Deco district. The Florida Keys, which are also barrier islands are only accessible through Miami-Dade County, but which are otherwise part of neighboring Monroe County. Miami is situated seventy miles from West Palm Beach, and thirty miles from Fort Lauderdale. In 2010, Cubans made up the largest population of immigrants (with more than half of the population,) with Colombians coming in second, Haitians in third, followed by Hondurans in fourth place, then Dominicans, Venezuelans, Peruvians, Jamaicans, Mexicans, and Argentinians among the highest group of expatriates. The age distribution is 21.9% under the age of 18, 9.9% from 18 to 24, 28.6% from 25 to 44, 25.6% from 45 to 64, and 14.1% who were 65 years of age or older. The median age was 38.2 years. For every 100 females there were 93.8 males. For every 100 females age 18 and over, there were 91.0 males. As of the census of 2000, there were 2,253,362 people, 776,774 households, and 548,402 families residing in the county, with an average population density of 1,158 inhabitants per square mile (447/km2). There were 852,278 housing units with an average density of 438 per square mile (169/km2). The racial makeup of the county was 69.7% White (49% White Hispanic, 20.7% Non-Hispanic White), 20.3% African American and Black (with a large part being of Caribbean descent), 0.20% Native American, 1.4% Asian, 0.01% Pacific Islander, 4.60% from other races, and 3.80% from two or more races. 57.3% of the population were Hispanic or Latino of any race. In relation to ancestry (excluding the various Hispanic and Latino ancestries), 5% were Haitian, 5% American, 2% Italian, 2% Jamaican, 2% German, 2% Irish, and 2% English ancestry. 1,147,765 Miami-Dade residents—50.9% of the total population—were foreign-born, a percentage greater than that of any other county in the United States. 47% of the foreign-born population were naturalized U.S. citizens. Among the foreign-born population, the most common countries of origin were Cuba (46%), Nicaragua (8%), Colombia (7%), Haiti (6%), the Dominican Republic (3%), Honduras (3%), Jamaica (3%) and El Salvador (2%). The age distribution is 24.8% under the age of 18, 9.1% from 18 to 24, 31.0% from 25 to 44, 21.7% from 45 to 64, and 13.3% who were 65 years of age or older. The median age was 36 years. For every 100 females there were 93.5 males. For every 100 females age 18 and over, there were 90.2 males. The median income for a household in the county was $35,966, and the median income for a family was $40,260. Males had a median income of $30,120 versus $24,686 for females. The per capita income for the county was $18,497. About 14.5% of families and 18.0% of the population were below the poverty line, including 22.9% of those under age 18 and 18.9% of those age 65 or over. As of 2010, 63.77% of the population spoke Spanish, 28.07% English, 4.22% French Creole (mainly Haitian Creole,) 0.64% French, and 0.55% spoke Portuguese as their mother language. 52% of the county residents were born outside the United States, while 71.93% of the population spoke a language other than English as their primary language. In the 1950s about 80% of the county population were English-speaking non-Hispanic whites. As of 2010 58.5% of the population natively spoke Spanish, with about half of them having low English fluency. 27.2% of the population spoke only English. Map of the municipalities (colored areas) and unincorporated (grey areas) communities of Miami-Dade County. Miami International Airport, located in an unincorporated area in the county, serves as the primary international airport of the Miami Area. One of the busiest international airports in the world, Miami International Airport caters to over 35 million passengers a year. Identifiable locally, as well as several worldwide authorities, as MIA or KMIA, the airport is a major hub and the single largest international gateway for American Airlines, the world’s largest passenger air carrier. 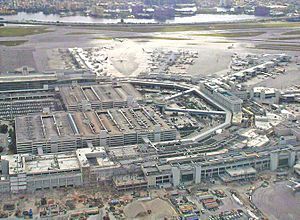 Miami International is the United States’ third largest international port of entry for foreign air passengers (behind New York's John F. Kennedy International Airport and Los Angeles International Airport), and is the seventh largest such gateway in the world. The airport’s extensive international route network includes non-stop flights to over seventy international cities in North and South America, Europe, Asia, and the Middle East. 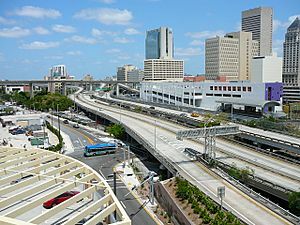 Public transit in Miami-Dade County is served by Miami-Dade Transportation and Public Works, and is the largest public transit in Florida. 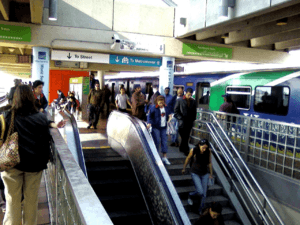 Miami-Dade Transportation and Public Works operates a heavy rail metro system Metrorail, an elevated people mover in Downtown Miami, Metromover and the bus system, Metrobus. 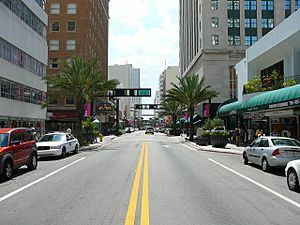 A street grid stretches from downtown Miami throughout the county. This grid was adopted by the City of Miami following World War I after the United States Post Office threatened to cease mail deliveries in the city because the original system of named streets, with names often changing every few blocks and multiple streets in the city sharing the same name, was too confusing for the mail carriers. The new grid was later extended throughout the county as the population grew west, south, and north of city limits. 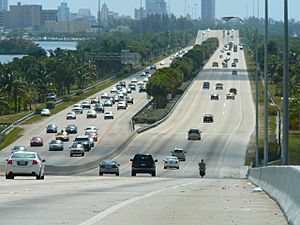 The grid is laid out with Miami Avenue as the meridian going North-South and Flagler Street the baseline going east-west. The grid is primarily numerical so that, for example, all street addresses north of Flagler and west of Miami Avenue have NW in their address (e.g. NW 27th Avenue). Because its point of origin is in downtown Miami which is close to the coast, the NW and SW quadrants are much larger than the SE and NE quadrants. Many roads, especially major ones, are also named, although, with a few notable exceptions, the number is in more common usage among locals. Although this grid is easy to understand once one is oriented to it, it is not universal in the entire county. Hialeah uses its own grid system which is entirely different in its orientation. Coral Gables and Miami Lakes use named streets almost exclusively, and various smaller municipalities such as Florida City and Homestead use their own grid system along with the Miami-Dade grid system adding to the confusion. 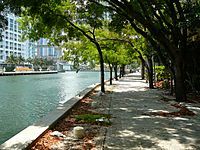 In the beach cities and parks of Miami Beach, Surfside, Bal Harbor, Haulover, Sunny Isles, and Golden Beach, the streets are coordinated with the main grid; however, their avenues are named. Marlins Park, home of the Miami Marlins. 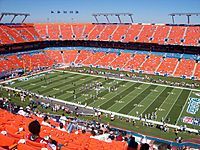 Hard Rock Stadium, home of the Miami Dolphins and the Miami Hurricanes. 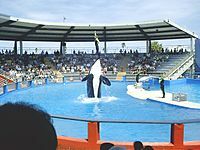 Miami-Dade County, Florida Facts for Kids. Kiddle Encyclopedia.